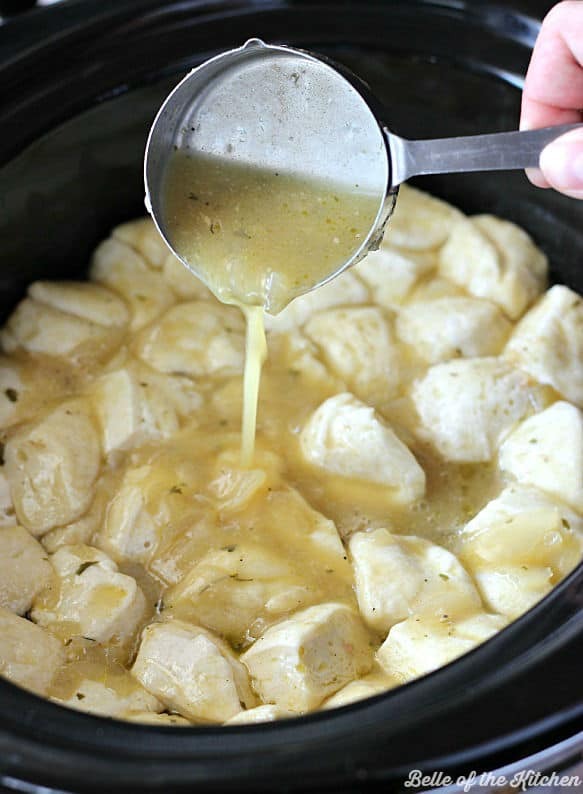 Slow Cooker Chicken and Dumplings – An easy version of the comfort-food classic that simmers away all day in the crockpot. 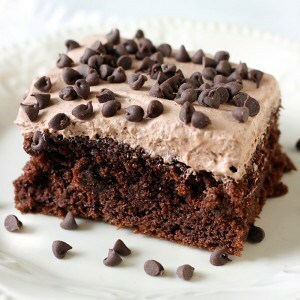 You will love this simple and delicious recipe! Chicken and dumplings has to be the epitome of comfort food. It’s funny, though, because as much as I love scooping up delicious spoonfuls of it now, Chicken and Dumplings was never really a meal that we ate growing up. The first place I discovered my love for Chicken and Dumplings was actually at Cracker Barrel. 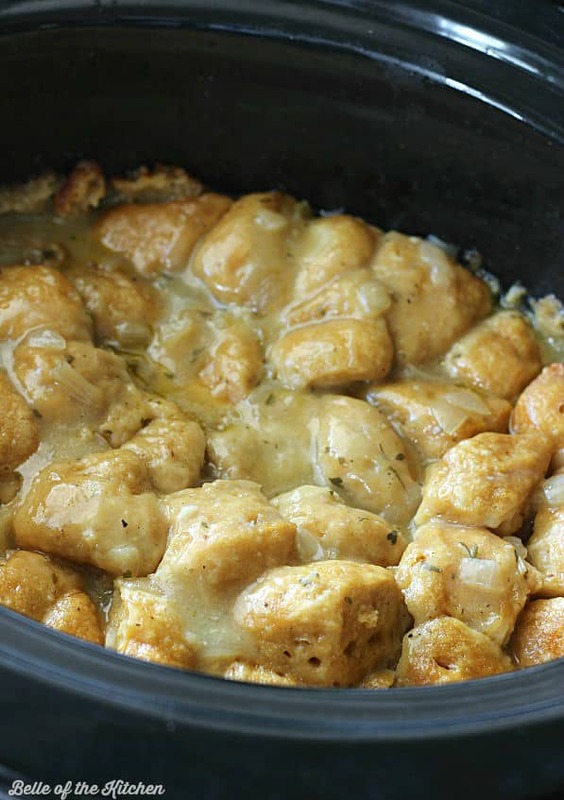 The delicious dumplings and gravy….SWOON! It’s one of those foods I crave out here in Hawaii and look forward to having when we are stateside again. 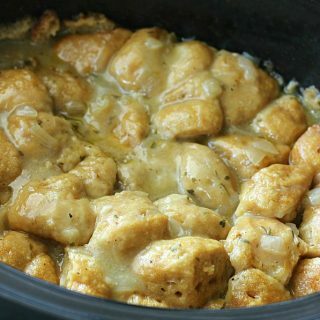 In the meantime, though, I LOVE to make this easy, shortcut version of Chicken and Dumplings. 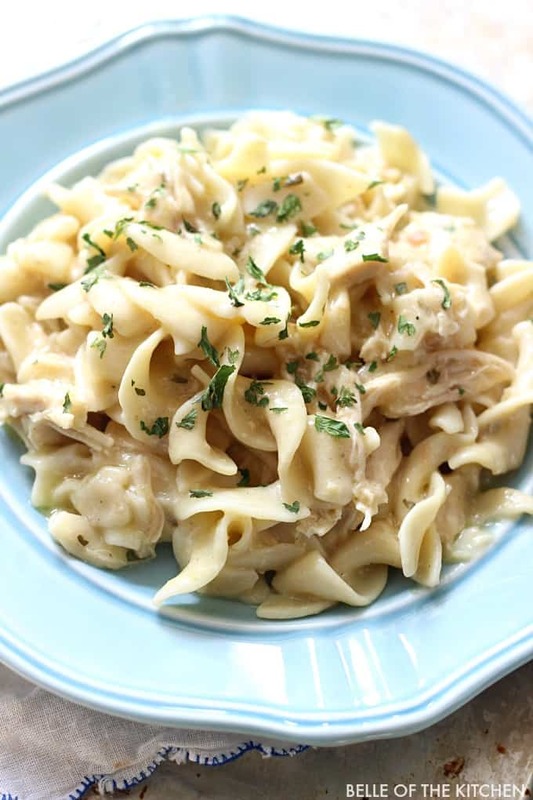 To get started, simply add some chicken, a chopped onion, spices, a little butter, chicken broth, and some cream of chicken soup to the bowl of your crockpot. Cook it all together on low for 6-8 hours, or high for 4-5 hours. 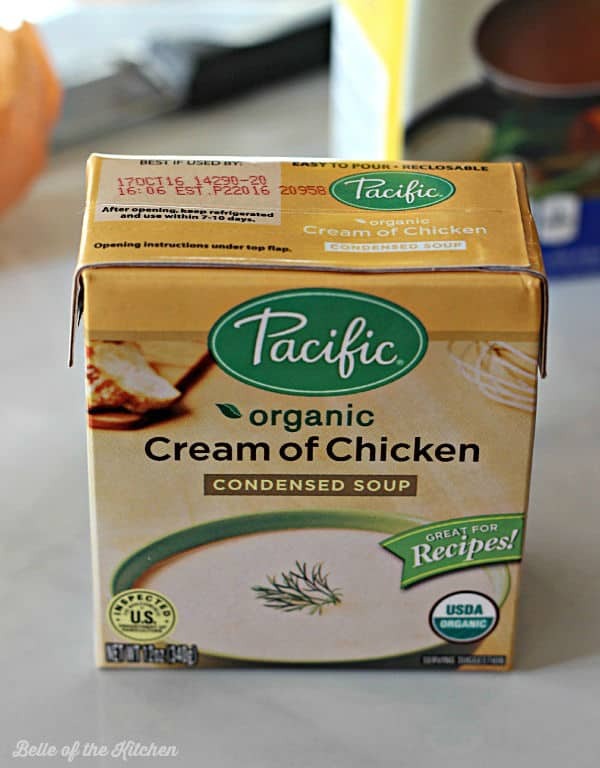 *A couple of side notes: I LOVE to use the Cream of Chicken soup made by Pacific Foods. It’s organic, it tastes good, and every ingredient is recognizable, which makes me feel a lot better about using it. After you’ve let it all cook for at least 4 hours on high or 6 hours on low, chop up some refrigerated biscuits into quarter size chunks and add to the slow cooker. Push them down so that they soak up the gravy while they cook. I also like to scoop up some of the gravy from the crockpot and pour it over the top. Put the lid back on and cook it all for 1 more hour on high. And when it’s done? 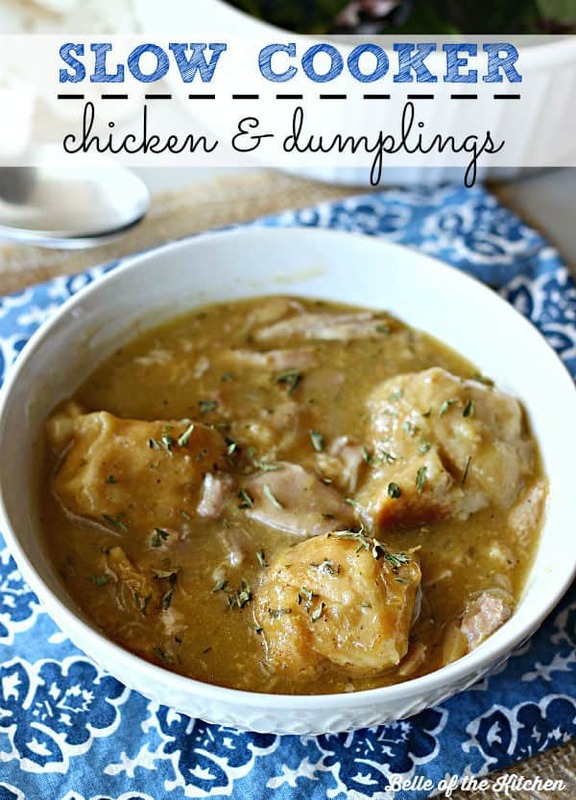 Yummy, goldeny, easy, Chicken and Dumpling goodness! 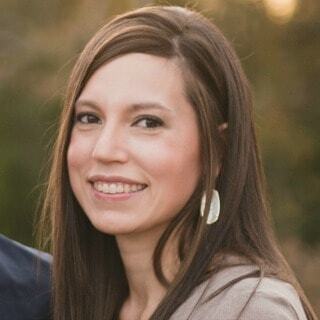 Enjoy y’all! Place chicken in the bottom of slow cooker, along with chopped onion and 2 TB butter. 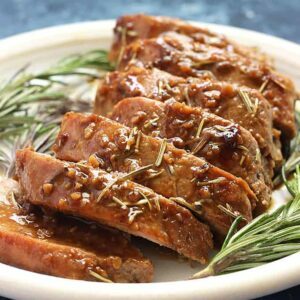 Sprinkle with dried parsley, seasoning salt, poultry seasoning, and garlic powder. Add chicken broth and cream of chicken soup to crockpot, and stir all ingredients to combine. Place lid on top and cook over low heat for 6-8 hours, or high heat for 4-5 hours. After cooking for at least 6 hours on low, or 4 hours on high, remove lid and stir mixture with a spoon or fork, breaking apart the chicken into smaller chunks. 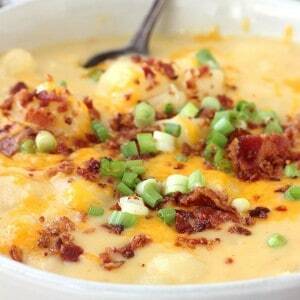 Chop the biscuits into quarters and add to the crockpot. Push biscuit dough down into the crockpot a bit so that they will absorb the gravy as they cook. Replace the lid and continue cooking for 1 more hour over high heat until biscuits are cooked through and begin to turn golden brown. Enjoy! This recipe was flipping amazing! I really enjoyed it. You are very right on the pacific condensed chicken soup… bomb! 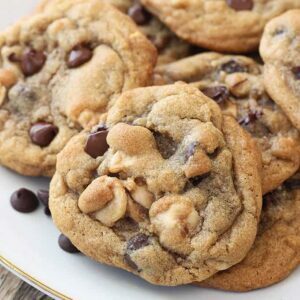 I enjoyed this recipe quite a bit! Mine turned out just a little sweet however and I have no idea why! Do you perhaps have any suggestions? Hi Andrew! I’m not sure about that! I’ve never had mine turn out sweet before. Maybe the biscuits you used had some sugar in them? I accidentally purchased refrigerated crescent rolls. Can I sub these for the biscuits? I’ve never tried that before so I’m not sure! How did it turn out? I decided to make these today- my 3rd time. It’s icy rain outside so not going to store and I only have crescent rolls. I’m going to try it but just hope I don’t ruin it. My choice was try with these crescent roll or cook over rice. If I wanted to make a little more juice what should I add? I didn’t know if yours made a lot or not? The child I’m making this for loves the juice :). Thank you! You could add a bit more broth!